8112 E Mulberry Street, Scottsdale, AZ.| MLS# 5834231 | White Rock Realty is now serving the Greater Phoenix area as well as Mesa, Lake Havasu City, Parker, and Quartzsite Arizona. We represent Buyer and Sellers alike in Residential, Land and Commercial transactions. 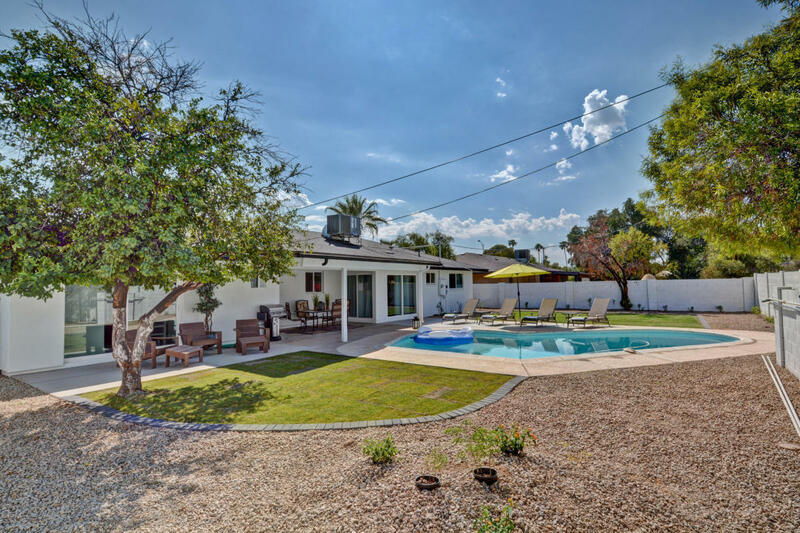 Beautifully updated mid-century modern, ranch-style home in the heart of Old Town Scottsdale. Completely remodeled - new plumbing, electrical, roof, AC, dual pane windows, multiple sliding glass doors. Gorgeous Arcadia kitchen with huge quartz Island and counter tops, stainless appliances, gas range and plenty of storage. This bright, open-concept floor plan features a great room, large picture window, 4 oversized bedrooms and 1 3/4 baths. Master bedroom features a large walk-in closet; master bath includes a roomy surround shower. The large 4th bedroom has custom built-in double bunk beds with private Arcadia doors leading to spacious, beautifully landscaped north-facing backyard, with pool and covered patio. Great for entertaining. Marketing Name: Near Old Town!